Great to get this 5/5 star review of Widdershins today from Northern Sky Magazine. 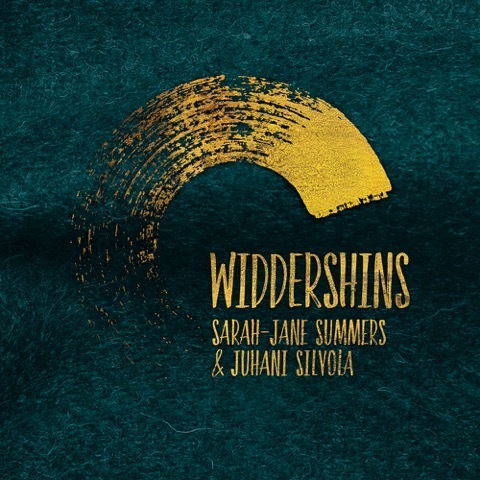 You get the distinct feeling, with Sarah-Jane Summers and Juhani Silvola’s latest outing WIDDERSHINS, that you’re in earshot of a fascinatingly impassioned conversation. And there’s no need to eavesdrop; on the contrary, the tête-à-tête is going on right under your nose, brazen as can be, without ever concealing itself behind closed fingers and breathy whispers. Sarah-Jane’s fiddle, a sprightly, female voice, leaps and dives over the surface of Juhani’s deep and sagacious acoustic guitar, the two often intertwining for moments of delicate respect and glistening, limpid kinship. And both voices are articulated with tongues of solid silver; Juhani moves crisply from chord to chord, note to note whilst Sarah-Jane manages to retain all the seductive expression of heartfelt Scottish and Norwegian folk music whilst reaching the speckless agility of a world class symphony violinist. Sarah-Jane Summers is, of course, a member of Scottish quartet Rant and the founder of Norwegian-Scottish outfit Fribo as well as a well-respected music teacher, whilst Juhani Silvola is one of Norway’s foremost musicians, composers and producers. Just like it says on the tin, WIDDERSHINS is an album that goes against the grain, constantly pressing against the boundaries to reach moments of genuinely fearless ambition. So whilst Silver Spring Wheel may well be a jaunty little tune on anyone else’s album, on WIDDERSHINS it becomes a mesmeric, flickering dance that, towards its final bars, melts into a barely audible flutter of plucks. Similarly, on Vaajakosken Maija, a delightfully tranquil tune rolls towards a truly haunting conclusion, courtesy of Sarah-Jane’s mournful, weeping fiddle. The album culminates in a fiery exchange with Spike on a Bike, a tune that puts so much demand on both guitarist and fiddler that you’re left with little else to do than to hold your breath. With its exhilarating pounding of both fingerboard and fretboard, this album closes on its knees, begging to be played again and, quite possibly, again. The single was impressive enough, but here they show an even broader spectrum of what can be achieved with just fiddle and guitar. Aktuell fordi: duoen som tidligere i år ga ut låten «Widdershins», til positiv omtale blant annet fra denne kanten, har nå kommet med et helt album med samme tittel. Singelen var imponerende nok, men her får de vist et enda bredere spekter av hva de kan få til med kun fele og gitar. De varierer fint innenfor både tradisjonell folkemusikk med skotske og norske undertoner, og en noe tyngre og energisk stil. Silvola har bakgrunn blant annet fra støyrock og black metal, samt studier innen jazz. Summers har sin musikalske tyngde fra en skotsk familie med flere generasjoner av musikere, i tillegg til studier ved Norges Musikkhøgskole. Begge har også bakgrunn fra improvisasjonsmusikk, og dette er et eksperimentelt samtidsprosjekt som viser frem to meget dyktige musikere. Current because: the duo who earlier this year released the track “Widdershins” to great critical acclaim including from us in this corner, have now released a full album with the same title. The single was impressive enough, but here they have shown an even broader spectrum of what can be achieves with just fiddle and guitar. They move easily within both traditional folk music with Scottish and Norwegian undertones and a slightly heavier and energetic style. Silvola has a background in, amongst others, noise rock and black metal, as well as having studied jazz. Summers gained her musical depths from being part of a Scottish family with several generations of musicians, in addition to studies at the Norwegian State Academy of Music. Both also have a background in improvisational music, and this is an experimental contemporary project that showcases two very talented musicians. I have been spending today beside the stove, cup of tea in hand, going through old messages and emails that I hadn’t yet answered. It’s amazing how quickly they pile up when you are focussing on other things like travelling, packing, unpacking, repacking, practising, etc. 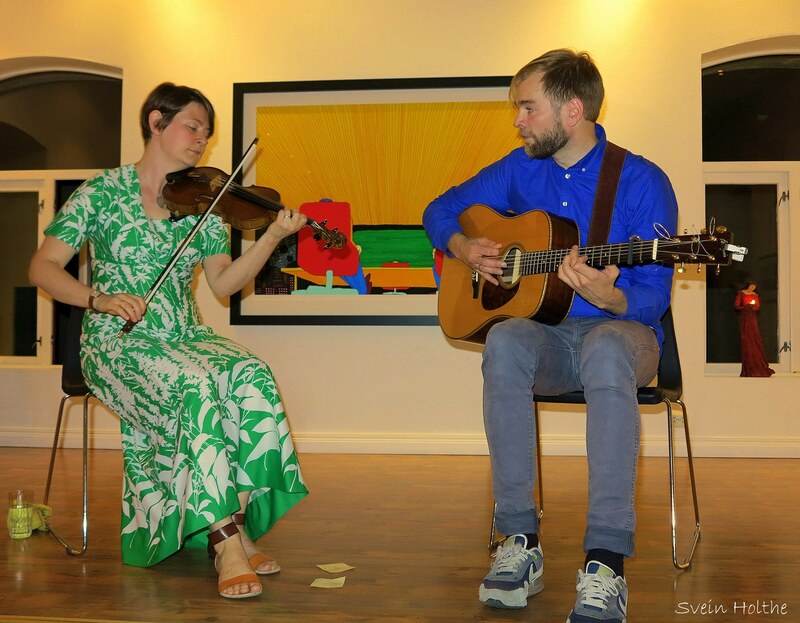 Anyway, I came across this photo taken by Svein Holthe at one of the first gigs of the Norwegian part of our Widdershins album launch tour at one of our favourite ever venues: Galleri Fenka in Levanger. Galleri Fenka is not only run by extremely kind, warm, helpful, generous, creative people, but it also houses amazing, inspiring art. To play in such a space is really special. On this occasion, we got to play in front of a Pushwagner painting no less! Apologies to the audience for blocking their view of it! A huge thank you to FolkJazzScena and to Ingrid Hojem in particular for having us and for looking after us so well. I can’t help but notice that we are both looking very tanned (yes, yes, it’s all relative, you know!) in this photo. I can quite safely say that the tan has disappeared and I am now back to looking almost as white as the snow on the ground outside! If you’re not already familiar with Pushwagner, click here and prepare to be dazzled by detail and colour! I’m a massive fan! 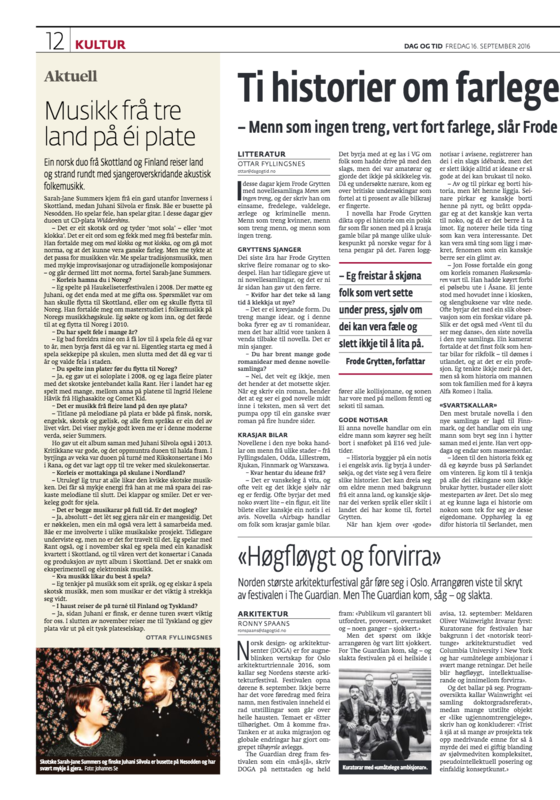 Der Pressetext klingt vielversprechend: „Hardanger-Fiedel trifft finnische Folkgitarre“! Auf „Widdershins“ – schottisch für „gegen den Uhrzeigersinn/gegen die Norm“ – bürsten die Geigerin Sarah-Jane Summers aus Schottland und der finnische Gitarrist Juhani Silvola die Tradition gegen den Strich. Das Ergebnis ist temperamentvoll und lebenslustig, in jedem Fall aber ausdrucksstark. Was die beiden virtuosen MusikerInnen aus ihren Instrumenten herausholen, wie sie die klanglichen Möglichkeiten ausloten, ist schon beeindruckend und geschieht häufig in atemberaubenden Geschwindigkeiten. Auf der Basis traditioneller schottischer Musik aus den Highlands entwickelt das Duo seine Stücke, öffnet sie für experimentelle Klänge und Improvisation. Abwechselnd treten die beiden Instrumente in den Vordergrund, und das ungeheuer dynamisch – es wird hörbar, dass die beiden MusikerInnen, die in Oslo leben, schon seit einigen Jahren ein Duo bilden. Das Booklet klärt über die teils historischen Hintergründe der “reels” auf und gibt einen Mini-Einblick in die schottische Kultur. If Tor Hammerø likes what we do, I’m more than happy. Sarah-Jane Summers and Juhani Silvola offer unique musical encounters. What could be more natural than that a Scottish violinist and a Finnish guitarist settle in Norway? A few things perhaps, but exceptionally nice is it in any case. Both Sarah-Jane Summers and Juhani Silvola are relatively new acquaintances for me. I “met” them for the first time in the spring when Silvola’s solo album “Strange Flowers” entered my home and my curiosity was immediately piqued. Summers was also there and the two, who are married to one another, have apparently found harmony in every way. I’m not sure why Norway was a stopping place for these two, but I have a strong suspicion that studies at The Norwegian State Academy of Music has been an important ingredient. Either way, the result is that we have two exceptionally talented instrumentalists; my goodness, do they sound great together. Here they give us eleven tunes with solid inspiration from both Scottish and Finnish folk music. As if that weren’t enough, here they also improvise a lot and genre is absolutely not important for them. Here they gather in a fiery landscape where they show temperament, emotion and empathy and when it is claimed that this is a meeting of the beautiful and light and the heavy and dark, it is not difficult to agree. The recordings are made live and nothing has been fixed afterwards, and it has not been necessary either. Because this is so beautiful, great and extremely personal that music lovers regardless of viewpoint have much to look forward to. 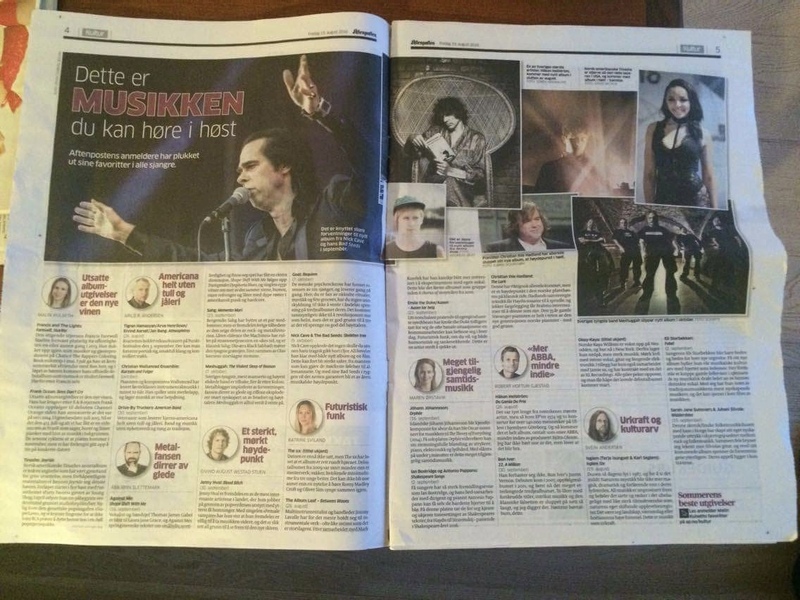 Dag og Tid did an interview with Sarah-Jane last week. You can read it here! In it, she talks about the new album ‘Widdershins’, what ‘widdershins’ means, how she and Juhani met, the overwhelmingly positive response of Norwegian children to Scottish music, and reveals the secret that her music career started off with bagpipe lessons at school. Our Widdershins album tour has kicked off! Very exciting! Hopefully see you en route! Folking.com has lovely preview of our new album, Widdershins, here. 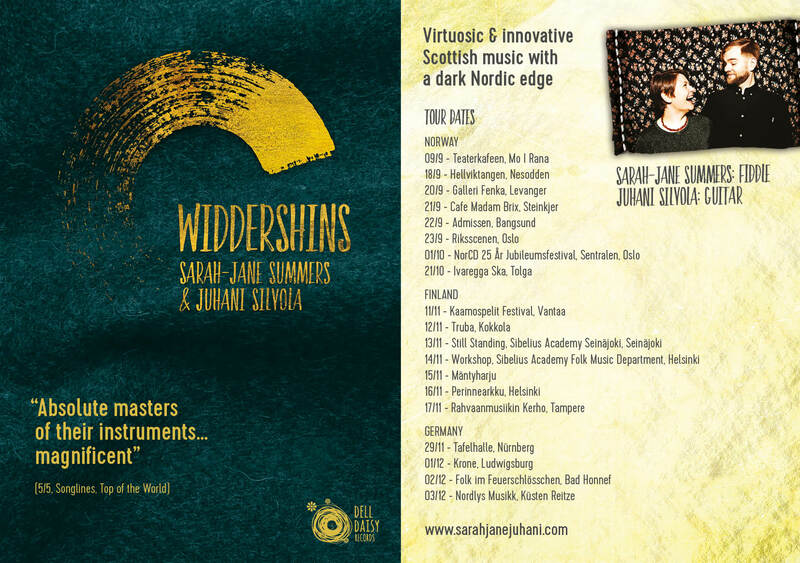 The follow-up to their highly successful debut album, Widdershins sees Norway-based Scottish/Finnish duo Sarah-Jane Summers & Juhani Silvola further develop their unique sound and telepathic interplay. Scots for ‘anti-clockwise’, or going against the norm (whether it be religious, social or musical), Widdershins perfectly sums up this exhilarating meeting of minds. This album conveys the duo’s raw energy directly to the listener, radiating a sense of joy and excitement. Each track was recorded live in the same room, and is left completely un-edited. 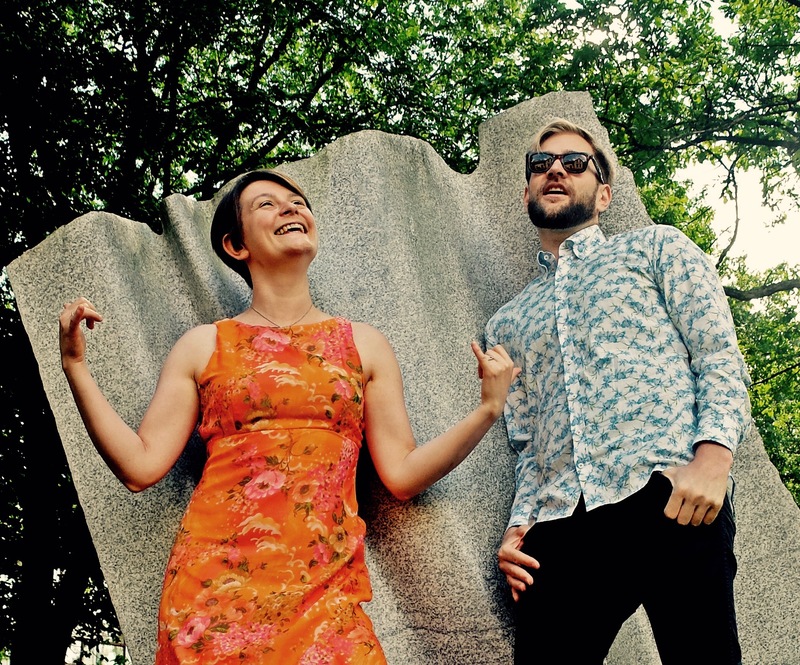 Sarah-Jane and Juhani create cutting-edge acoustic folk music, encompassing the whole spectrum of emotions. From the nocturnal mood of ‘Sydänyö’ to the acoustic noise-rock of ‘Widdershins’, from the rollicking fun of ‘Spike On A Bike’ to the haunting bleakness of ‘A’Cheapach Na Fasach’, this album invites you on a cinematic journey into strange and wonderful new worlds. Taught by the late great Donald Riddell, Sarah-Jane plays with the award-winning group RANT, as well as working with contemporary music. Juhani is a sought-after Finnish guitarist and record producer. Both have released critically acclaimed solo-albums. 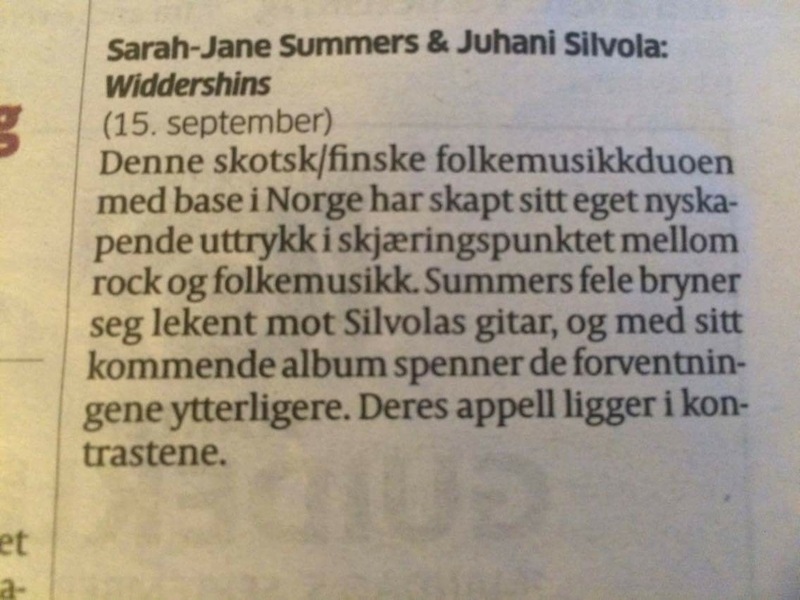 Really delighted that Aftenposten, one of Norway’s biggest quality newspapers, has recommended our forthcoming album, Widdershins! We are in extremely good company! ‘Widdershins’ is due out on 15th Sep with an album release tour in Norway, Finland and Germany, details of which will be posted very soon.